Oh wow. I wish you had a source for this one. I’d like to know where it came from. Hahahaaa… Yes, mansplaining is a dangerous, illicit sporting craze that his the headlines every now and again. You know…like planking. 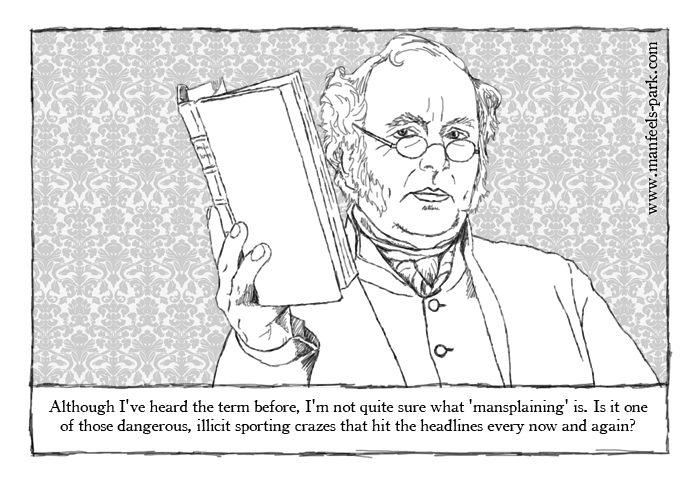 ‘Mansplain’ means the exact same thing as ‘patronize’, even unto the Latin roots, but has worse grammar. But how can one point out this fact without being patronizing? And if we can’t, then how are we to tell the people? oh paradoctor, i only just discovered manfeels park today in the middle of 2016 and now i’ve been binge reading these delicious comics all afternoon. and the comments too. this might be one of your best. though it’s a tad short. do you think you peaked early? i think i’m a little in love with you.